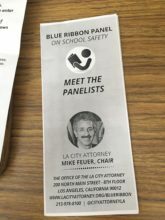 Hollywood High School hosted a school safety meeting on Sunday, April 8 which had many representatives from LAUSD and the City of Los Angeles come together in hopes of finding a possible solution for students when it comes to school safety. Numerous panelists gave their opinion towards recent school shootings. All these panelists had great things to say, but in the whole point was to hear out the crowd which consisted of students, parents and teachers. For the most part when it was the audience time to speak, they only had one minute which I thought was unfair because it is a meeting for us and we probably deserved more time to voice our opinion towards the school board. Although much of what the crowd said was a bit harsh, but at this point everyone’s opinion matters. In honesty, it was not as successful as I thought it would be, but it was still important to hear how others feel towards this subject. I hope for future meetings they can lead towards the path of having more students and teachers opinions. It is important to have student opinions and it is critical for finding a possible solution for a path to better safety in schools. As we all know the WASC team has been lurking around campus this week. 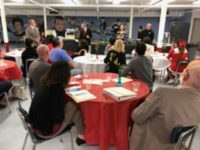 It all began on Sunday March 12 when faculty and staff gave a warm welcome to the WASC committee. Students and parents were also present as they met with the committee while having a late brunch. Yesterday, March 12 it started with an early meeting between WASC and ICC members. Students also had a privilege to meet the team as they would get asked questions about the school and hopes of answering truthfully. Throughout the day any given WASC member was able to walk into any ones class just to take a brief look at what was going on. At times questions would be asked to students and teachers but it is just part of what they are here to do. WASC also known as, Western Association of Schools and Colleges. The purpose of WASC is to briefly observe what is going around campus. Also to assure and evaluate the quality of education that the students are receiving. Tuesday Mar. 13 will be much of the same as they will continue their evaluation across campus. It will all end with a faculty meeting in where the WASC visit will be debriefed. We hope that the WASC observation goes well for the school and remember do not slack off or panic when a WASC member enters the room. As we all know our school has seen many faces leave and with that new faces appear around campus. Assistant Principal, Henry Lazo will now be a part of the list as has his last day on Feb. 20. For a temporary time he was involved in a family and medical leave act (FMLA), as he had to deal with family health issues. Unfortunately, things are not going great and so it led to his tough decision. In his letter to the faculty he wrote, “I also wish to inform you, that after much thinking, soul searching, and prayer, I have decided that I will be retiring as of February 20, 2018.” Although he did not spend much time in Hollywood his contribution to this school was a success. He would always look for the best interest in the students and it will not be forgotten. He encouraged students to do the right thing such as getting to class on time. He worked for the District for 30 years and he said, “this was a tough but necessary decision.” As he is now retiring, he will now pursue being a Senior Pastor much like his father-in-law was. Unfortunately the spot has been open for a while because his father-in-law passed away and Lazo hopes to fill in the position. He had been filling in as interim Senior Pastor and he now hopes to get the full-time position. Lazo’s contribution to this school as been greatly appreciated and we hope he finds better days and also a successful time serving as a Senior Pastor. As the Spring sports continue, track and field will hope for a successful season. As former Coach Adolfo Carcano has departed from the school, Coach Kenny Valencia will lead his team as the official head coach. After coaching in cross country, he now turns his attention to track and field where he can hopefully reign in just as much success. Valencia said he hopes to create a team of hard-working boys and girls who will commit and rise to the occasion. At the moment, the team has been practicing every day after school because season is right around the corner. Unfortunately, at the moment they are a bit low on competitors. There were a few seniors who departed, so that is a reason for there being low amount of players. The returning team mates have been putting in more work every day so that they could become even better, but they will need a couple more people to get the success they so desperately look for. Will you be the difference? As the first semester comes to a close, not only will we be stressing out over finals and leaving this semester behind, but we will also be saying good-bye to our principal, Mrs. Sanchez. She had the privilege of working here for several years but now she must move on. She has been promoted to become the new Staff Relations Field Director for Local District West. She announced her departure from Hollywood High on Aug. 18. Knowing she had only about four months left as principal, she did her best to make it memorable for the students and teachers. Although there can be various opinions towards her and her decisions, she still tried to make our school stand out from others by making decisions that she thought were good for us. 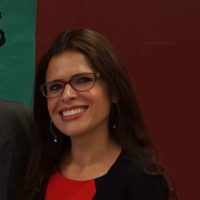 Her presence around the school was extremely active because at any given moment during school hours someone could easily bump into her because she was always walking around observing what students were doing. Her final day as principal will be on Dec. 15 and any kind of farewell could mean a lot to her. So be sure to do that as a sign of respect for what she has done for the school. Basketball season has finally arrived for the boys and girls, hoping to start off on the right foot. The boys had their first game on Nov. 17, at home. Although the Varsity team could not get the win they fought for to the very end against Manuel Arts, it was a very entertaining game. It went down to the wire. On the other hand JV managed to get the win without any difficulties. The girls did not have the privilege of playing on the same day as the boys, but on Monday, Nov. 27, they played Grant High School on campus. The team sadly lost both games. The girls have a total of 4 games this week and they hope to win all of them because they have put in a lot of work. They hope to display their skills against their upcoming opponents. The team will be playing against Miguel Contreras, Chavez, and Bernstein. While the boys are coming from a big win against Hawkins (away) on Monday, Nov. 27, both games were played very competitively. The boys have two more games later this week, including one with their biggest rival, Bernstein. They will hope to defeat them in this big game. Basketball is now in full gear and they hope to have a great season. Halloween is today, yes today. Although some don’t celebrate this holiday due to religious reasons it is still a very fun holiday to be apart of. Dressing up makes everything extremely fun because you get to be someone that you are not in disguise. Dressing up means you are guaranteed to some free and delicious candy. Trick-o-treating is the key to most peoples night on Halloween because you get to roam around the neighborhood and possibly other places and that makes the trick-o-treating very special. Trick-o-treating is something that can get carried away by some and that is why there are certain precautions that everyone should take while being involved in this great and entertaining holiday. Remember trick-o-treating isn’t a necessity because there are several other things you can do to have a safe Halloween such as just staying home and watching scary movies with the family. So go ahead and treat yourself to a safe and nice Halloween. We are just about a week in of October but that does not mean you can just let it go to waste. October could be considered one of the most fun months of the year and it can bring the happiness out of most of us. 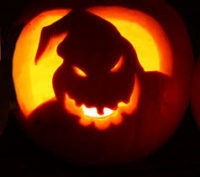 Especially the children who are eager for one of the most anticipated holidays of the year, Halloween. Halloween is a very fun holiday for most people and one of the best ways to embrace it is by dressing up in a fun costume and just having a great night alongside friends while trick-or-treating. Of course, there are many other ways of enjoying the rest of the month. Such as just having fun with friends and family while watching horror movies. Which is a perfect fit for the current month we are in. Many different activities can contribute to the happiness and memories of a single month. Although many people aren’t fans of Halloween, it can still prove to be a great way of just having fun with people. Finding a pumpkin path or looking for festive treats would be a great way to celebrate October. Go out with the family and feel the weather and how it changes. In the end, there are many ways that can contribute to the happiness and memories to a great October, so doing things like this will most likely lead to a memorable month.